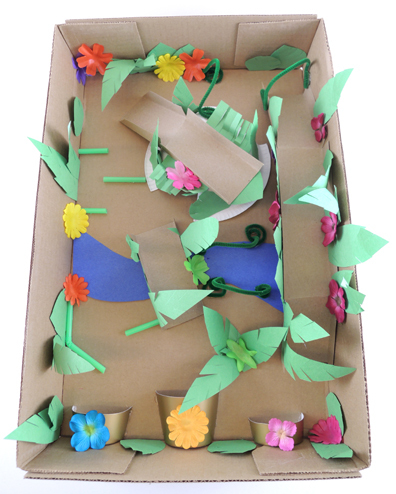 It’s a jungle out there, but we bet you can safely navigate your bouncy ball up ramps, over bridges, past drinking straw obstacles, and through pipe cleaner wickets to the goal! We recommend reading The Zabajaba Jungle by William Steig (Farrar, Straus and Giroux, 1987). In a dreamy, dangerous journey through the Zabajaba jungle, young Leonard and his trusty bolo encounter a number of jungle creatures and treacherous obstacles. A Steig classic. You can also add fabric (or construction paper) flowers for some pops of color! 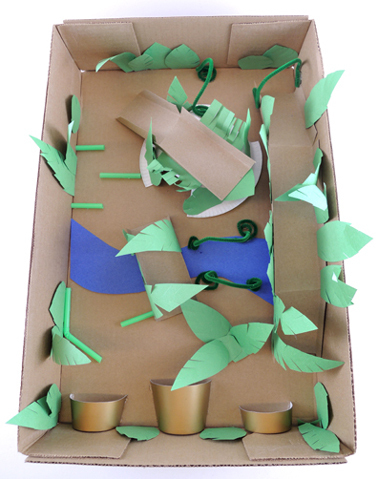 To play, drop a bouncy ball in anywhere, then navigate through the obstacles and foliage by tilting and turning your box top. The ball goes in a cup, you win! 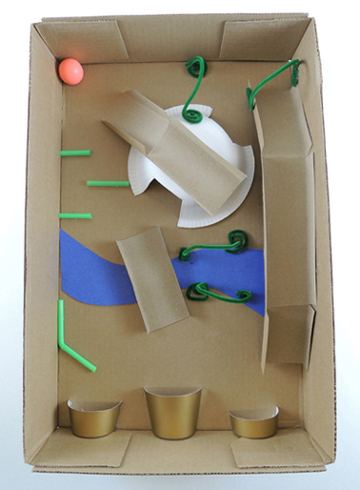 Bonus fun – use multiple balls at once, or play with one kid at each end of the box top! 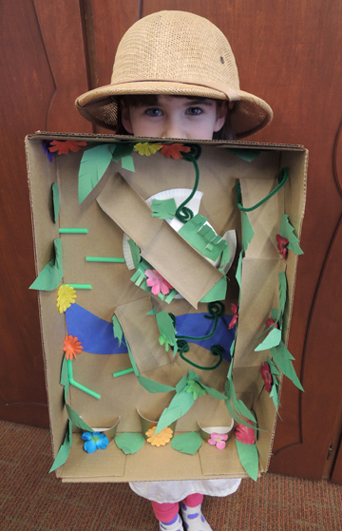 This entry was posted in Snap Story Times and tagged activity, art, ball, challenge, children, craft, craft project, easy, game, how to, instructions, jungle, kids, library, literacy, maze, motor skills, program, race, simple, story time, story time project, storytime, The Zabajaba Jungle, William Steig by Dana Sheridan. Bookmark the permalink.